I am relatively new to quilting, started 7 years ago. 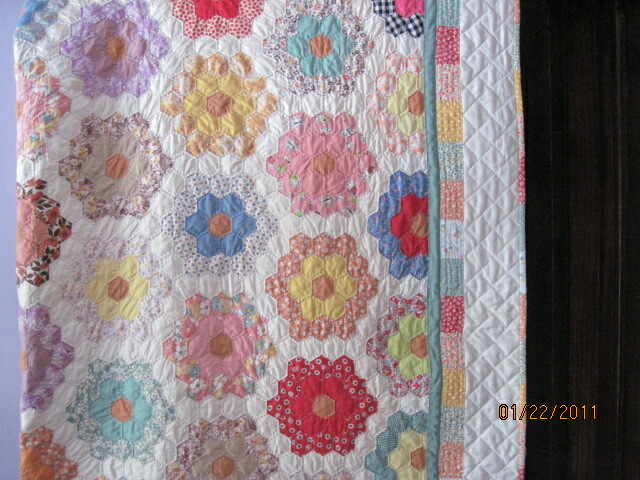 My latest project is a Grandmother's Flower Garden quilt. So far I have completed 62 flowers that are 12" each that I have sewn together with a row of solid white hexagons between each flower. Now my dilemma, what should I do to finish the sides. Should I do a bias binding around each hexagon? This sounds hard to me!!! I noticed some people add several rows of white hexagons then use a ruler to square the four side off. I have also seen some use an insert of fabric along all four corners blocking off the hexagons. I cannot understand how this is done. I am making this quilt for my grandson but will also be entering it in my guilds quilt show in March of 2013. The second questions is how to quilt it. A local quilt show that has a long arm said I should hand quilt it. What are your thoughts??? I'm working on one right now that sounds similar. 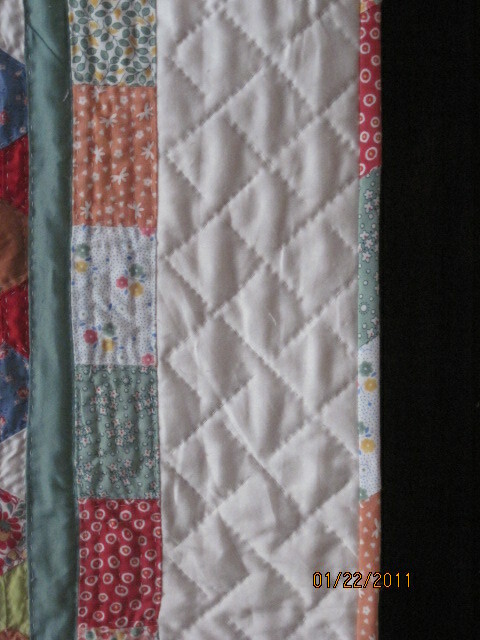 I plan to add solid strips to the sides as a border so I have a square to work with. Just remember, its your quilt and you get final say. I don't understand what you mean by adding a solid strip to the sides. Do you just line the solid strip to the ending edge of the last row of hexagons or do you square off the last row of hexagons then ad the solid strip? I am a lefty and a visual person!! My mom picked up a flower garden top for me at an antique store with all the edges unfinished. I basted under the raw edges and then took a wide border strip and put it up under each side, basted it together and sewed them on with top stitching. It showed off the edging, which I thought it was prettier than just trimming blocks off straight. This might not be the proper method, but it worked for me. Wish I had it with me, I'd post it to show you. Good Luck! Just think of a plain strip of fabric to make the border. Last edited by bookworm; 02-23-2012 at 07:15 AM. I think that GFG looks much more finished and elegant when you use facing to bind it. The edges make people think that you did something very difficult. Yet it's quicker and easier than any other method, and it lays perfectly flat. Thanks dunster for the info. I checked out the web site and this looks promising. All of you ladies on the GB are the GREATEST!!!!! My GFG handmade by my grandmother has a narrow white binding around the outer edges. I would prefer that or the facing. I wouldn't give up the lovely scalloped edges. What a great tutorial! I am making a similar quilt and haven't been able to decide how to bind it. I have never been really fond of the GFG layouts for these paper pieced hex pieces so I am doing my own layout. I'm calling it Grandfathers Flower Meadow. If I ever get it done I'll post a photo. I hate to think about the hand quilting. That has not been my favorite thing. Guess it might become "my thing". Thanks again for the link to the tutorial. Thanks so much for this tute, ans I love she's doing it on her FW on top of it. I am working on my 2nd GFG now, and appliqued the hex edge to a stright length of fabric making a stright edge border. I then did applique flowers and leaves etc. to the border. I plan to do a scallop edge binding on the one I am working on now. The other was stright edge binding. I do like the facing in the youtube demo. Great tip--she's made it plain. I never wanted to do an irregular edge but now it looks fun. Thank you sooooo much! 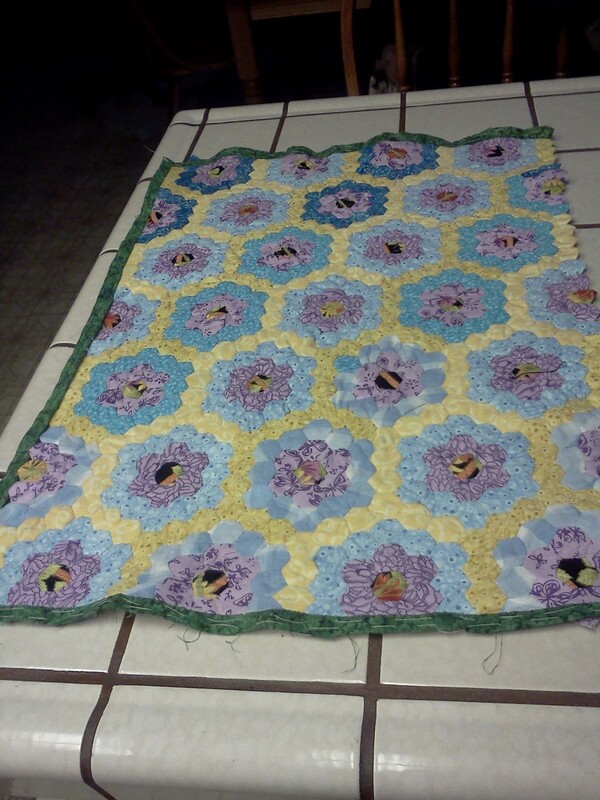 I am also working on a GFG for my grand daughter...have my hexie flowers done but still have to sew them all together. I've been stuck during this process on how to bind. I've look at the ones in the gallery and just couldn't figure it out. Now I have a good idea how to do it! Now if I can just figure out how to bookmark this for when I'm ready, I'll be set! Great tute link, thanks! Using blue scraps for years on hexagons...this is a great finish, hope I can find the tute again once I near the end of piecing. 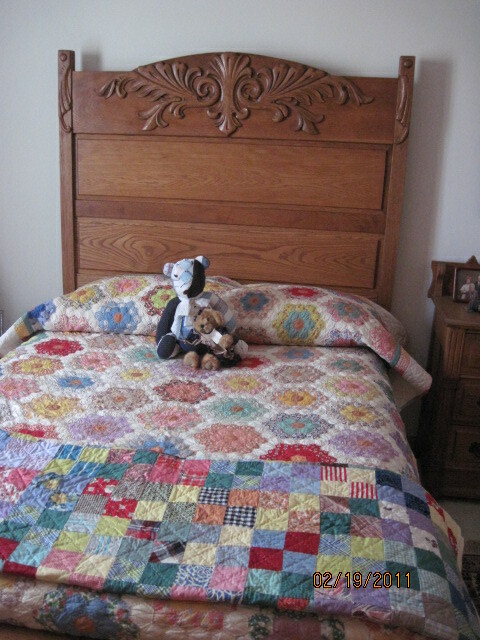 The quilt was made in the 50s - the border was added last year with reproduction fabrics. Nothing's a mistake. It's a learning experience. Some experiences, you learn more than others.